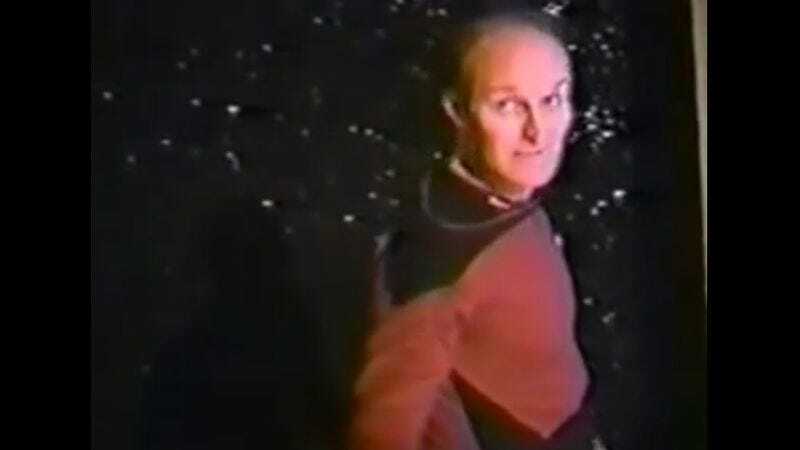 In 1988, a couple of Star Trek fans decided to charge up their camcorder, break into the set of Star Trek: The Next Generation, and film their very own behind-the-scenes documentary. The video has been a obscure part of Trek lore since clips briefly surfaced online in 2007, and last week the full video of their adventure resurfaced on YouTube. It shows raw footage of a production that’s amateurish even by illegal-trespasser filmmaking standards. The Star Trek fan site Memory Alpha identifies our hero as Greg R. Stone, a special-effects technician who worked briefly on the show, which would explain how he got access to the stage after hours. It would also explain why the host acts like he owns the place, manhandling set elements with no apparent compunction. When he knocks over a sickbay bed around the 12:30 mark, for instance, he laughs it off with a joke. Alas, he in fact does not own the place, and the saga comes to an exciting conclusion in the last 30 seconds of the video when security arrives and sends the guerrilla filmmakers into hiding.